A political controversy has erupted over Facebook popularity. Over the past few weeks, there has been a focus in Cambodia on what one might call an ongoing social media war between the ruling party and its opposition. The Facebook page of the current Cambodian prime minister Hun Sen, who has governed the country for more than three decades, now has more than 3 million ‘likes’, or a million higher compared to the account of now exiled opposition leader Sam Rainsy. But Hun Sen has been accused of ‘buying’ support from fake users and click farms in India and the Philippines. Meanwhile, Sam Rainsy and his subordinates in the opposition would continue to brag about their growing online following for the next three years. But six months ago, Hun Sen officially endorsed his Facebook page, which substantially expanded his reach and influence. In January, Hun Sen finally surpassed Sam Rainsy in terms of Facebook ‘likes.’ He also instructed his ministers to regularly monitor his page in order to address the concerns of netizens and respond to the suggestions made by Facebook users. He even proposed the formation of a Facebook panel in the bureaucracy to improve governance. Most average Cambodians seem amused by the selfies of Hun Sen, especially his posts about his family. But critics believe it is a strategy to soften his strongman image and make young people forget that this ‘grandfather’ has clung to power in the past three decades. On March 6, Hun Sen announced that his Facebook page already had three million ‘likes.’ But the Phnom Penh Post newspaper immediately published a report which revealed that the bulk of the recent ‘likes’ for Hun Sen’s Facebook page came from India and the Philippines. The report also mentioned that Sam Rainsy still has more supporters from Facebook accounts based in Cambodia. On March 15, the Phnom Penh Post published an update which confirmed that Hun Sen’s Facebook page continues to receive a disproportionate number of ‘likes’ from India and other countries. This prompted Sam Rainsy to accuse the government of promoting the Facebook page of Hun Sen by “hiring poor and jobless” Internet users from India and the Philippines. He uploaded a photo containing instructions from a government minister on how civil servants should maximize the Facebook page of Hun Sen. 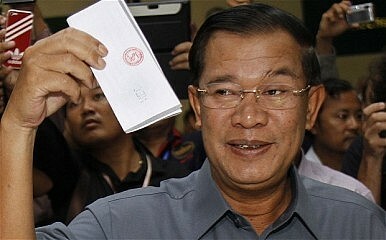 He said the instructions prove how the government is manipulating the surge in popularity of Hun Sen’s Facebook page. A minister mentioned by Sam Rainsy admitted that the government is aggressively endorsing the Facebook page of Hun Sen but denied that it is creating fake accounts. The minister filed a defamation suit against the opposition leader for “twisting the truth and maligning the reputation” of the country’s leader. The ruling party spokesman insisted, rather oddly, that the ‘likes’ are genuine and that Cambodians should be proud for having a leader who has many fans from India and the Philippines. Why Did Cambodia's Opposition Leader Quit? Sam Rainsy has resigned ahead of the country's elections.